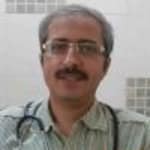 Dr. Bharat Bhalani is a renowned Pediatrician in Civil Lines, Delhi. He has had many happy patients in his 24 years of journey as a Pediatrician. He has done MBBS, MD - Paediatrics . You can meet Dr. Bharat Bhalani personally at Sant Parmanand Hospital in Civil Lines, Delhi. Book an appointment online with Dr. Bharat Bhalani and consult privately on Lybrate.com. My daughter is 2 yrs old. She gets fever and cold very frequently. One doctor's opinion is that she has tonsil and if she has tonsil up to 5 yrs she will have same problem and nothing cann't be done please guide me. From history your daughter is suffering from recurrent tonsillitis. Avoid cold drinks, ice-cream, chocolates, cream biscuits etc.Tonsillectomy is required after 5 yrs of age if your child suffers from recurrent tonsillitis. My baby is 5 months old and passes urine 2 to 3 times within half an hour and 15 to 20 times a day. What could be the problem and what should I do about it? Please help me. Hello, Breastmilk is mostly water, so such small babies tend to urinate more,that is absolutely normal. The frequency will gradually go down. Hi, I am 7 week 1 day pregnant. I am working my office timings are 9-6 but it took almost 4 hours (2 hrs in the morning, 2hrs in the eve. I go via cab) to reach my office. Though am not having nausea, vomiting any symptom, everything is fine but still in just want to know that sitting for almost 13-14hrs will effect anyway my baby's growth or should I take leave right now till 4th month and then continue my job? Please advice on this? Your schedule is definitely hectic. We usually advice our patients to have 8hrs night rest and 2hrs daytime rest. Try to have a break when you r in office. Baby growth is more when you r beyond 5th month pregnancy so growth is as such not a problem. This question related to my younger sister she is 12 years old she has always stomach pain after 4-5 hours whats is the reason for this? or is this any infection in her stomach. This could be mittelschmerz, pain due to her ovaries getting matures and she have menarche soon. Other causes have to be ruled out ; take meftal -spas when there is pain and contact me privately. My 4 months old baby having cold and cough and his nose is blocked like sounds gur gur please help me what should in do. Instill saline nasal drop in each nostrils 3 to 4 times in a day for 2 to 3 days. If no relief, consult your pediatrician. My 3 year old is sick with a temperature of 100 degrees she cant keep anything down including liquids. What should I do? She might have developed a mild infection of stomach like acute gastritis dont do self medication consult a doctor preferably child specialist. She will be alright. Next month my son will be completing 2 years. The issue with him is that till date he don't speak words except mumma and papa. Please suggest me doctors what should I do so that he talks? Or how can I develop an interest to learn things? If he hears normal and follow your verbal direction after proper understanding, there may be that his desire is being fulfilled on his pointing finger without his speaking. (usake ishaaron par kam hona). If it is condition, give him opportunity to speak otherwise consult pediatrician. Baby feeding Female, 34 What should be baby feed in ml for one month baby? As milk supply is less and we top up with formula. continuously breast feeding baby every time for last 15 days but still milk supply has not increased. Pls suggest. A one month baby should be given 60-90 ml of formula every 2-3 hours. To increase your breast milk supply you can take fenugreek capsules (2 capsules 3 times/day). Also you should take plenty of water (1.5 to 2 L/day). There are foods which increase breast milk supply- oats, carrots, avocado, spinach, fennel seeds, spinach, garlic, etc. My child weight only 13 kg .he is picky eater. He does not like chapati ,vegetables .he likes only chocolate, milk,pizza and some nonvage food. He is very emotional and crying very easily. I giving him pediasure regularly from last 1 year but still no change in his weight. Please suggest me something . Pediasure is not magic to increase wt. Give him well cooked all available nourishing food in home of his choice. He is 3 yrs now. Don't force him to eat. Avoid chocolate etc and sweetened drinks . Hi my son is 1 yr, wt 10. 2 kg uska tummy fula sa rhta hai motion karne k baad bhi. Is he having a gas problem or something else wat should I do? What he should eat. A 1 year old has normal forward curvature of the lower spine. This is called lumbar lordosis. This make his tummy looks protruded. However get him checked by pediatrician for poor tone of the abdominal muscles due to rickets. He should eat anything he likes which is healthy and prepared for the rest of family. If he is breast feeding it can be continued or whole milk (Amul), can be given. You can get his stool checked for any worm infestation and get a deworming drug prescribed.